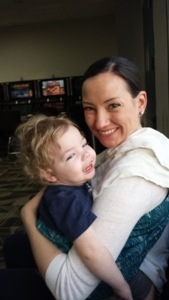 Two weeks ago, we took Beckett to see a CVI doctor in Pittsburgh. 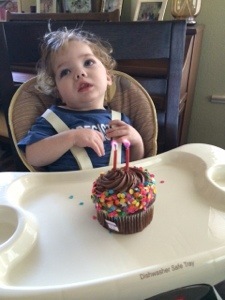 We came home to birthdays, parties, and a busy week of therapy. Now, we’re finally settling back into our routine, so here’s the recap as best as I can remember. We headed to the airport at 5:30 Tuesday morning. 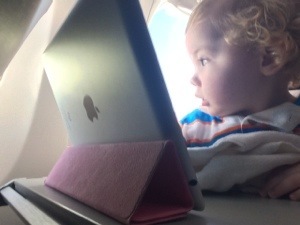 This was Beckett’s first time flying. We had a quick trip to Vegas then a 4 hour flight to Pittsburgh. 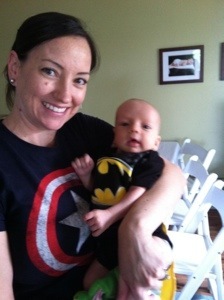 Beckett napped for the first hour, but other than that, he was wide awake and perfect! 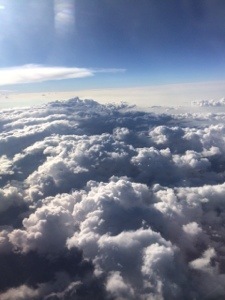 Because of the time difference, it was 5pm when we landed. Of course, we were stuck in rush hour traffic so we got off the freeway and grabbed dinner before heading to our hotel. 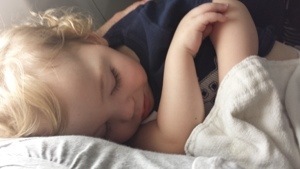 Beckett took another short nap while we ate, then was up until 11. It doesn’t seem that he’s a fan of hotels. He was up screaming at 2am then again at 5 (which was 2am our time!) and wide awake ready for the day. By this point, I’m thinking he’s going to be a beast for his appointment. 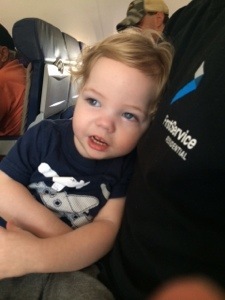 After waiting 4 months for an appointment and traveling across the country, he’ going to be completely out of sorts. But no, as always, he surprised me! He took a catnap on Jimmy’s shoulder while we walked through the hospital. He woke up a few minutes in to his appointment and was a perfect angel! So this doctor, she literally wrote the book on CVI. Her entire career is dedicated to studying children with CVI and has developed a scale on which to measure the child’s functional vision. The scale ranges from 0 being no vision to 10 which is typical vision. The scale is split into three phases. This is all way too complex for me to explain, but ultimately, in all the areas she observed, Beckett’s at a 3.5-4+ in all areas putting him in phase 2. 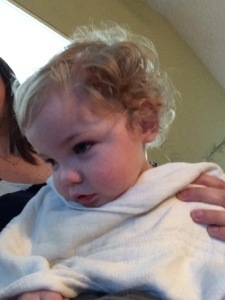 Phase 1 is more static vision, getting him to fixate on an object. Phase 2 is more vision + function which is where we’re now working. 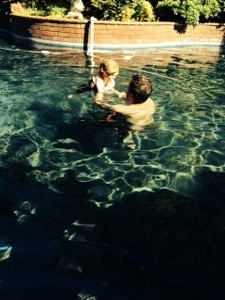 When we first arrived, she went over his history and we discussed his current therapy routine. Her husband is a neonatologist and he sat in on the first half of the appointment too. 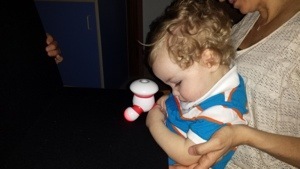 They had him working with an ipad then we moved on to playing with a bowl full of whiffle balls the a little massager that vibrated and lit up. We ended with another app where there were specific targets to touch as opposed to getting a reaction from touching anywhere on the screen. 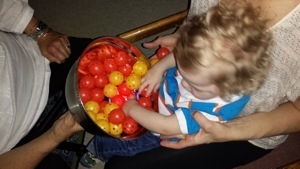 Dr. Roman was impressed with Beckett and noted that he refined his movements and had decreased latency the longer he played with an object. All good things! 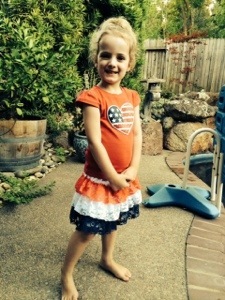 She sent us a long report and wants to keep up with Beckett through videos and email so we can help him progress over the next year. 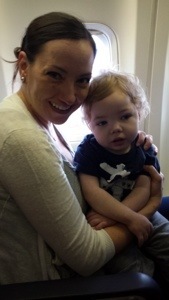 We’re so glad we found Dr. Roman and were able to make the trip and get Beckett evaluated. It’s so helpful to know where he’s at with his vision and have an idea of where we should be headed to help Beckett achieve his full potential. 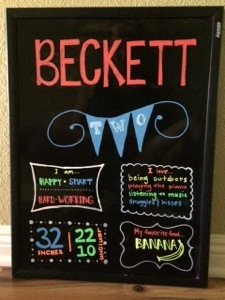 It’s also encouraging to have another professional be optimistic about what Beckett will be able to do. 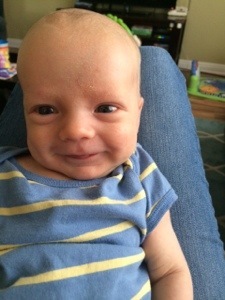 Coen had his 2-month check up yesterday. He’s 10 pounds, 12 ounces and 23.5 inches. 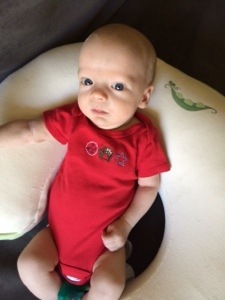 He’s 50th percentile for height, 25th for weight and 75th for head circumference. He also got his first round of vaccines. It was not a good day. All he wanted to do was sleep, but he was too uncomfortable to stay asleep. Poor baby boy. He’s still adorable though! 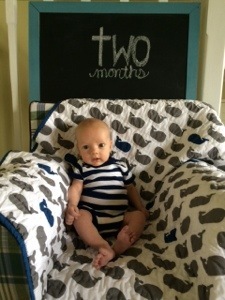 Here’s his 9-week picture. 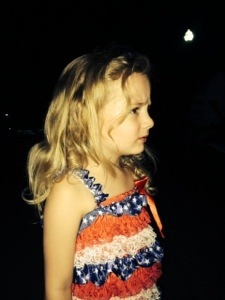 Happy birthday, beautiful Beckett! 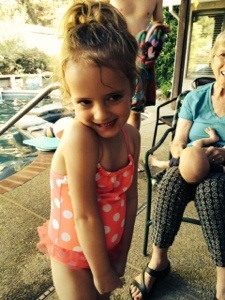 How are you already 2? 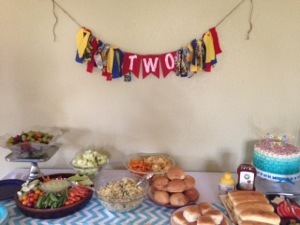 We had a lovely party for our little man over the weekend. 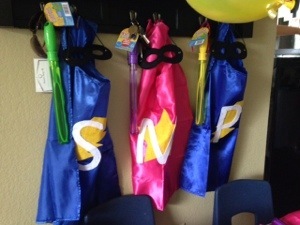 He had tons of fun celebrating at his super hero themed party with some of his favorite people. 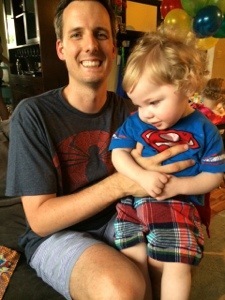 Beckett got an awesome superman shirt with a cape from Aunt Lisa, perfect for the party theme. 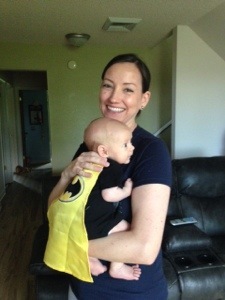 Coen wore a batman onesie with a cape and Addie was simply super girl. 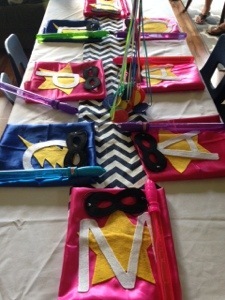 The kids got capes with their initial and a mask. 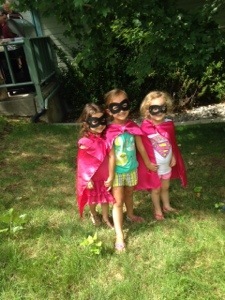 They were pretty adorable running around saving the world. 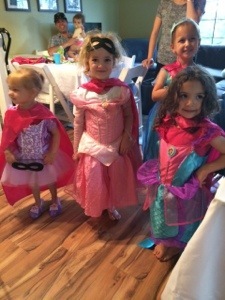 I think my favorite moment was when the girls put on their princess dresses with their capes. 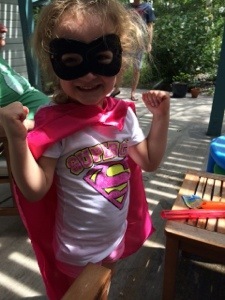 Because really, the only thing better than a princess is a super princess. 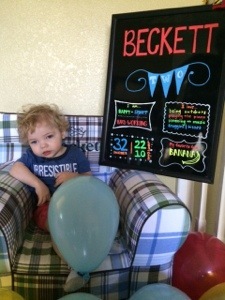 Last night, I snuck in Beckett’s room for one last picture of our 1-year-old. 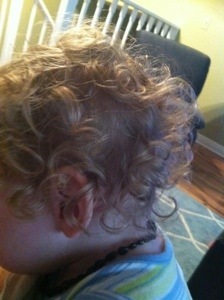 And this morning, woke up to a big 2-year-old boy! He’s such a joy in our lives. 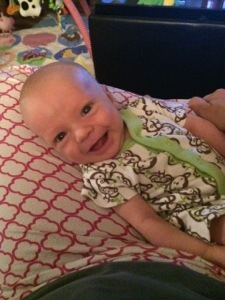 We are so blessed to be his parents! 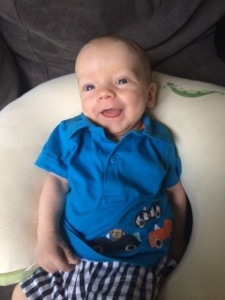 We’ve had two amazing months with this little darling! 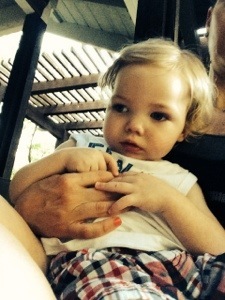 He's getting so big! 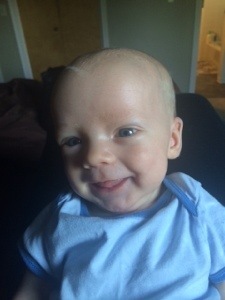 Shots and check-up are this Thursday, but I just wanted to post this adorable picture of our sweet little boy! 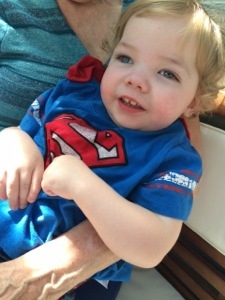 Another fun and busy week for Coen! He went to a birthday party for Addie’s dance friend, a wedding BBQ where we did a trial run with his first bottle, accompanied mommy to a doctor’s appointment, had his first non-family sitter for a full hour at mommy’s new gym, and had his first slumber party with gram and gramps while we took Beckett to Pittsburgh. All that in addition to running Beckett to therapies. There was no easing this kid into the world. He just got thrown into the chaos! 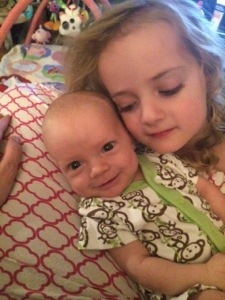 I suppose he should get used to it being a third child. He’s been full of smiles but is definitely forming a strong opinion about his likes and dislikes. 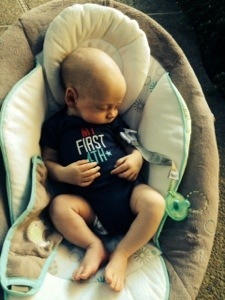 He’s also cutting back on naps and having a few longer sleeps, sometimes four or five hour stretches. 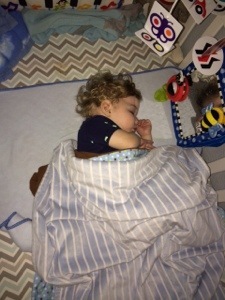 He actually had his first night’s sleep in his own crib last Thursday! Most nights he starts there and ends up in our bed by morning but we’re working on it! After leaving him for two days, I’ve realized he’s a total mama’s boy. 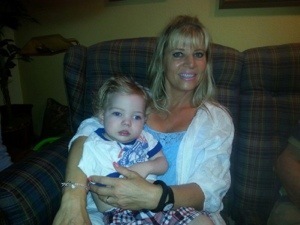 He’s going to have a tough transition into daycare in September! Hopefully he’ll learn to entertain himself before then. 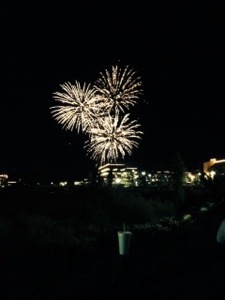 Crazy week, sorry for the delay in posting about our 4th of July weekend in EDH. We had so much fun! 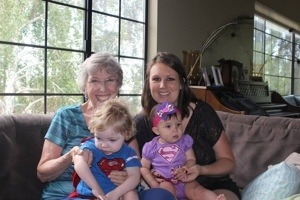 We arrived Thursday afternoon and got all settled in to Nana and Poppy’s. 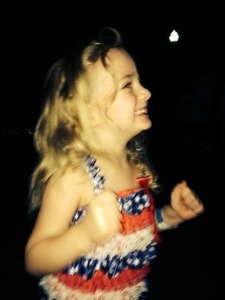 That night, we took Addie and Coen to Town Center to see fireworks. 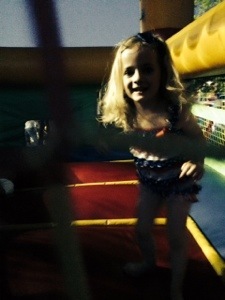 This year, we hung out in the kids’ area where Addie spent a good amount of time in the bouncy house. 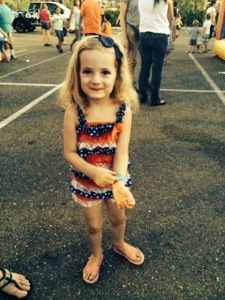 On the 4th, we did a little shopping (can’t beat $1 flip flops!) 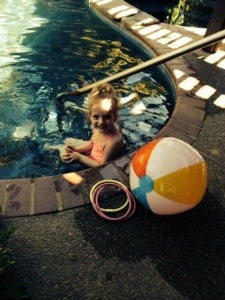 and spent the afternoon swimming at Dorothy’s house. 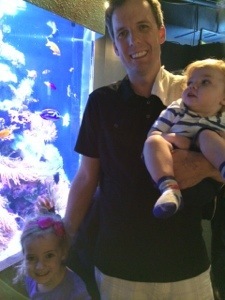 Saturday, we loaded up the kids and drove to San Francisco to check out the aquarium. 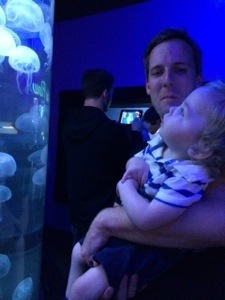 Despite the awful traffic, it was well worth the trip just seeing how much Beckett loved the jellyfish! 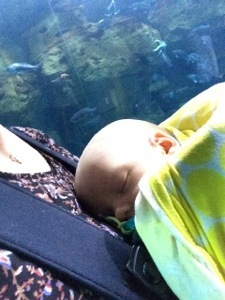 Addie touched a stingray and Coen slept the whole time! Overall, a successful outing! 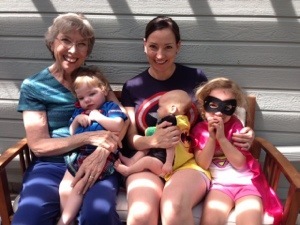 Sunday, we had more fun family time before heading back home Monday to start another busy week. 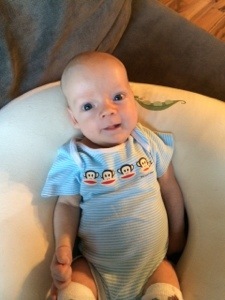 Coen was 7 weeks last Thursday. I can’t believe it! He’s getting so big and is going through a phase of staying awake nearly all day with just little catnaps. It makes it nearly impossible to do anything productive, but he does usually fall asleep in the bjorn when I take him shopping, so at least I have that to fall back on. 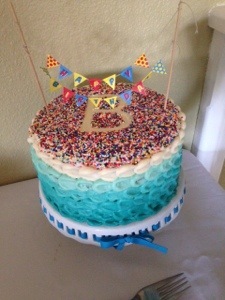 Coming up this month, 5 birthday parties – including Beckett’s!! 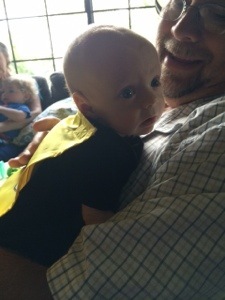 !, a wedding BBQ, and a trip to Pittsburgh to get Beckett’s vision evaluated. Lots of exciting things to come this summer!